Well, it’s been another two weeks, and yes, I realize I’m really late on this and will be for the one that was actually supposed to be for this week, but what can you do. (I’ve been siiiiiick). 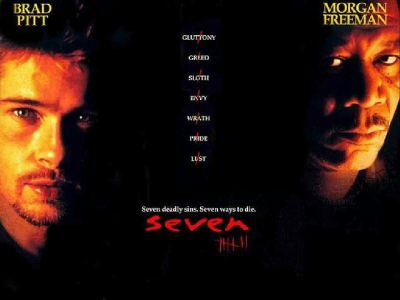 I’m back with another post for the Breaking Emotions Blogathon hosted by Mettel Ray. Last time I broke down five scenes that were especially awkward, and this week I’m going for five scenes that are especially tragic. Ones that rip hearts out and drown audiences in tears. So get your boxes of tissues handy as I break down five scenes that had me bawling my eyes out (or at least internally, I actually never cry at movies). Coming in at number five is…..
Vesper is like my favorite Bond character of all time (probably besides James Bond himself anyway, I don’t know), so when she died at the end of Casino Royale, I was pretty distraught. The part of the movie where James Bond is all travelling around the world with Vesper in a romantic and idyllic way was probably pretty unrealistic given that it’s James Bond, but I bought it because Vesper was such an awesome character and Eva Green was so great in the part (seriously, I still need to find her in some other movies because she’s awesome). James goes to such lengths to save her, and then ultimately fails, and it’s just so tragic. He can’t properly cope with her death, giving us all the damaged and womanizing James Bond that we love (I guess….?). These scenes will never not make me (figuratively at least) weep for a few good hours. Coming in at number four is…. You might have been able to guess that Les Mis, released just last year and directed by Tom Hooper, was going to make it on here, just based on the title. There’s no better scene to pick out of this movie in terms of heart-wrenching sadness. 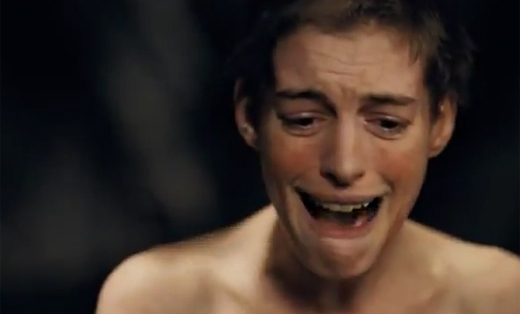 Poor Fantine has just had her life completely ruined in so many ways, and been beaten down until she is reduced to letting other people raise her kid while she turns to prostitution. It’s incredibly sad, and Hathaway really makes you feel it with this song. Coming in at number three is…. The end of Who’s Afraid of Virginia Woolf? 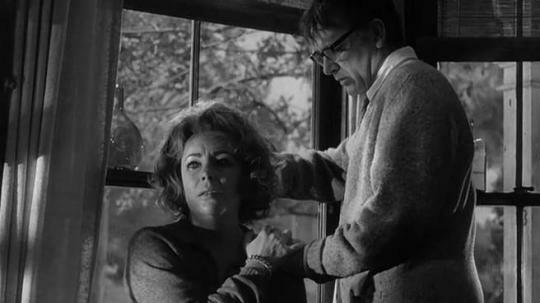 Released in 1966, directed by Mike Nichols (who seems to be making a lot of appearances on these lists, his subsequent film was The Graduate which was on last week’s), and adapted from the play of the same by Edward Albee, Who’s Afraid of Virginia Woolf? is a triumph, especially in the acting department. For the whole film you’ve seen these characters rain down emotional and verbal abuse on each other, and only in the final moments do you see exactly why. It’s not because they hate each other, it ‘s because they’re incredibly and profoundly sad, and their sadness and regret is destroying them and their relationship. They can’t pretend any more, and at the end of the film the truth comes out. It’s shocking and tragic, and it really got to me. Coming in at number two is…. Now this list was originally at about ten scenes, and two of them were from The Godfather films. (directed by Francis Ford Coppola, released in 1972 and 1974). The Don’s (Marlon Brando) death originally had this spot, and I kept flipping and flopping between the two of them. The way I see it, the Don’s death is the start of the tragedy that is culminated in this shot. 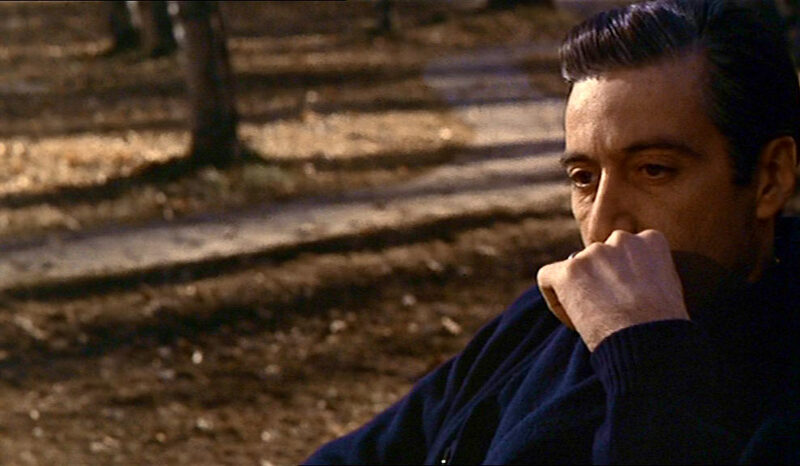 It’s nothing but Micheal (Al Pacino) sitting on park bench, presumably thinking about how far he has fallen. You can certainly bet that’s what the audience is thinking about, and it’s not a pleasant topic. It’s here that we feel the Don’s absence the most. Directed by Nicolas Meyer and released in 1982, Wrath of Khan is considered by many to be the best Star Trek film. A big reason for this is the phenomenal performance by Ricardo Montalban as Khan, and another is this tragedy that occurs at the end, when one of the most iconic and beloved characters in the franchise and movies in general, meets his demise. In his attempts to save the Enterprise and its crew, Spock (Leonard Nimoy) takes out McCoy (DeForrest Kelley) and exposes himself to dangerous radiation. Kirk (William Shatner) arrives to late to stop him, but just in time to say goodbye. Their final exchange is just completely heartbreaking. “I have been, and always shall be, your friend.” And with that, one of the most powerful friendships in the history of cinema/television comes to an end (for the time being). Adding to this is Spock’s funeral, which is also devastating. I almost had this at number two because Spock does come back, but overall the whole thing is just too tragic for me not to have at number one. It’s so hard to imagine the Enterprise without Spock. Live long and prosper. So there are my five sad scenes. *sniff sniff* I’m getting pretty teary eyed just writing these here. But anyway, let me know what you think of my choices, and I’ll be back at some undetermined time to break down the emotions for this week: smiles and thrills. aw man tear jerkers get me everytime. the scene from independence day with the first lady? oof, right in the feelings. Yeah, that one is pretty sad too, for sure. Thought you’d appreciate number one though! Scotty breaks out the bagpipes and there are many tears. Some excellent choices, that moment in Casino Royale is so heartbreaking. Thanks. That part gets me every time. Also the part where Vesper’s crying in the shower. So sad. Totally agree about that shower side, really shows the emotional tie that forms between Vesper and James. Sorry about grammar error above I meant to say shower scene. Hey it’s cool. I know what you’re getting at 🙂 completely 100% agree. Guys are allowed to cry towards the end of Disney’s classic, ‘Old Yeller’. And maybe the last moments of the original Rat Pack, ‘Ocean’s Eleven’. When Ocean and his crew discover the money they robbed from five casinos is being cremated. Guys are allowed to be shocked at the abrupt ending of ‘Dog Day Afternoon’. And be elated and feel patriotic at the end of ‘The Life and Death of Colonel Blimp’. I just watched The Life and Death of Colonel Blimp today, actually. There were a couple of sniffles at the end, definitely. Great list! Vesper and Bond’s relationship in Casino Royale is so magnetic, and it’s great to start of the Craig installments with a romance that is so layered and heartbreaking. And, I’m pretty sure Anne’s voice reverberated in my ears just by looking at her picture. I can’t speak much on Wrath of Khan (haven’t seen it yet) but I bet anything my money would land that scene in number one too. OH, Spock & Kirk. GREAT list! Thanks! I agree, it really helps humanize Bond instead of just having him be a womanizing jerk. You should see Wrath of Khan though! It’s widely considered the best of the old star treks, and I think it makes Into Darkness more interesting if you’ve seen it. Thanks for commenting, and sorry for the late reply! Taking it easy during April until I can start up David Lynch/Twin Peaks month in May! You know, from Die Hard?